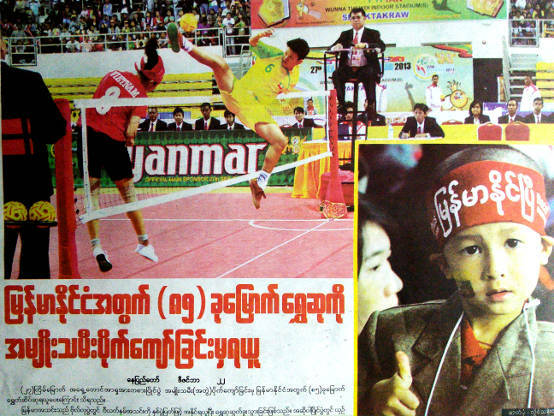 Sports in Burmese is called အားကစား | ah3-ga1-za3. Alternatively, you can also say ကစားပွဲ | ga1-za3-pweare3 or အားကစားပွဲ | ah3-ga1-za3 pweare3. We have seen this word ပွဲ | pweare3 before in lesson 26. It generally refers to a festival where people have fun and watch shows and entertainment complete with roadside stalls selling food, snacks, souvenirs and various merchandizes-- kind of like a carnival. When it comes to sports, the word ပွဲ | pweare3 is equivalent of the word "match" or "event" as in "sporting event" in English. For example, ဘောလုံး | bau2-lone3 means a football (soccer ball), and ဘောလုံးပွဲ | bau2-lone3 pweare3 means a football match. ဘောလုံးပွဲ သွားကြည့်ကြမယ် | Bau2-lone3 pweare3 thwa3 kji1 ja1 meare2 -- We will go watch a football match. ဘယ်တော့လဲ | beare2 dau1 leare3 -- When? အခု | a-khu1 -- Now! Do you see the pattern? Generally, the word "strike" ရိုက် | yite is used if you hold something in the hand such as tennis racket or golf club and strike an object. You use the word "play" ကစား | (ga1-za3) for the rest with the exception of kicking and tossing the ball around using your foot. Back in lesson 3, we have seen the word ကြစို့ | "ja1-zo1", and "ja1-meare2" which both refer to the word "Let's". Earlier in this lesson, we used the phrase သွားကြည့်ကြမယ် | "thwa3 kji1 ja1 meare2", which means "Let's go watch..."
In lesson 19, the word ရအောင် | "yah1-oun2" is used, which also means "Let's". Also in lesson 19, we use the word ကြရအောင် | "ja1 yah1-oun2", which is the plural form of the word ရအောင် | "yah1-oun2". The word ကြ | "ja1" in ကြရအောင် | "ja1 ya1-oun2" indicates that the activity will take place for more than one person. In lesson 21, we used yet an another word ပါစို့ | "ba2-zo1" to express the word "Let's". What's the difference among different types of "Let's" in Burmese? When you use the words ကြစို့ | "ja1 zo1" or ကြမယ် | "ja1 meare2" you are taking the role of leadership position to suggest something to someone or to a small group of people. The word ကြမယ် | "ja1 meare2" is almost certain that some event WILL take place without objections. The word ပါစို့ | "ba2 zo1" has more determination and courage in it, and is used to make a proposal to provoke and incite a larger audience. The words ရအောင် | "yah1-oun2" or ကြရအောင် | "ja1 yah1-oun2" don't have the ordering tone used by the leader of the pack as in: "I want to play. How about you?" We will build up the complexity of the phrase using the word ကြမယ် | "ja1 meare2" explained above. ကစား | "Ga1-za3" means "to play". So, ကစားကြမယ် | "ga1-za3 ja1 meare2" means "Let's play." Remember, ကြမယ် | "ja1 meare2" is a plural word to indicate that some event WILL take place. When the phrase does not contain the pronoun "they", "we", or the names of the parties involved such as in the phrase ကစားကြမယ် | "ga1-za3 ja1 meare2", by default, it refers to "us". In another words, "We will play." ကစားကြမယ် | ga1-za3 ja1 meare2 -- (We) will play; let's play. မြန်မာနဲ့ မလေးရှား ကစားကြမယ် | myan2-ma2 neare1 ma1-lay3-sha3 ga1-za3 ja1 meare2 -- Myanmar will play with Malaysia. ဒီည ဗမာနဲ့ မလေးရှားနဲ့ ကစားကြမယ် | de2 nya1 ba1-ma2 neare1 Ma1-lay3-sha3 neare1 ga1-za3 ja1 meare2 -- Tonight, Myanmar will play with Malaysia. No, it's not a typo error. "With" is repeated in the above sentence. The literary form of the colloquial word နဲ့ | neare1 used as a conjunction in the phrase is နှင့် | hnin1hnin1. ဗမာ | ba1-ma2 refers to Burma. This is also the name of the majority Burmese ethnic people. In the original National Anthem after the independence, the word ဗမာပြည် | ba1-ma2 pyi2 was used. It was later changed to မြန်မာပြည် | myan2-ma2-pyi2 to reflect the inclusion of more than 100 ethnic people. My translation of Myanmar into English is "the land of the fast and the strong". လဲ | leare3 -- ? ဘယ်သူ နိုင်သွားလဲ | beare2-thu2 nine2 thwa3 leare3 -- Who won the game? The word သွား | thwa3 is the verb "to go". In the above phrase, it is used as a particle and modifies an another verb nine2 (to win) into the past tense "won". It's kind of like asking: "How did it go?" Refer to lesson 14 for more examples. တယ် | deare2 -- affirmation. ဗမာရှုံးသွားတယ် | ba1-ma2 shone3 thwa3 deare2 -- Myanmar team has lost the game. သရေကျသွားတယ် | tha1-yay2 kja1 thwa3 deare2 -- It was a draw. By the way, ဟန်းဖုန်း | hun3 pfone3 is saying the word "hand phone" with a Burmese accent. What's a "hand phone"? It is the translation of 手机 "Shou ji" in Mandarin Chinese into English where 手 "shou" refers to the hand and 机 "ji" is the machine. That's what a cellphone or mobile phone is called in places like Singapore. ဒီနေ့ ဒီမှာ ရပ် ကြရအောင် | de2 nay1 de2 hma2 yut ja1 ya1-oun2 -- Let's stop here for today!